This site contains affiliate links to products. We may receive a commission for purchases made through these links. Please read my disclosure for more info. Do you buy Easter gifts for kids or fill an Easter basket with goodies each year? I’m curious to know others’ family traditions. I’m not sure why, but as a Christian I have ambivalent feelings about Easter baskets and the over-commercialization of Easter. This might be where you roll your eyes and say, You take everything too seriously, don’t you? Yep. Guilty on all counts. However. Of all the holidays, this one holds the most meaning for me, and for all Believers. And for my kids, I want them to know what Easter is really all about: the love of a Savior who took on the sins of all mankind – so that we could have a relationship with Him and a future home in heaven. It’s Resurrection Sunday- the day that changed everything, for everyone willing to accept this amazing gift. Now that’s something to celebrate! I guess the question I face each year, then, is how to appropriately celebrate this season, which really should be our focus year-around. We celebrate at church and while gathered around the dinner table with extended family later that day. These are memories I’ll always savor. And, of course, there’s always those Easter eggs to hunt down in the back yard because that’s what people do, right? 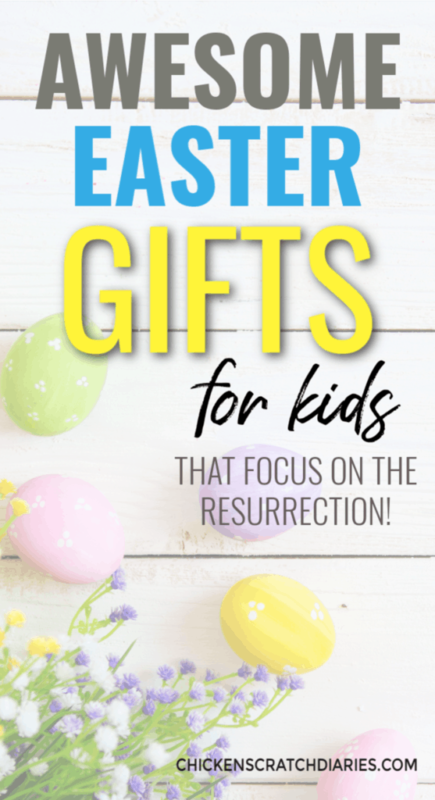 But giving gifts is NOT my love language, so this combined with my hope of conveying the right message means that I’ve hard a hard time justifying a reason to buy my kids gifts or fill an Easter basket with meaningless trinkets. But maybe you’re like me and if you’re going to give Easter gifts to your kids, you want it to reflect the true meaning of Easter. 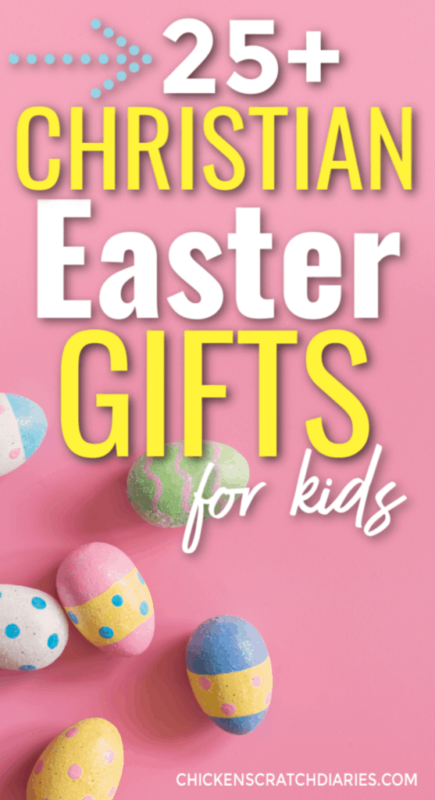 If so, I think you’ll like this list of gift ideas that can help to encourage your child in their faith. This cute stuffed racoon prays the Lord’s Prayer and there are several other “buddies” you can collect that sing songs and recite scripture. Perfect for babies and toddlers. I especially like that it has different textures for sensory development. I love muslin swaddles, so these oversized blankets with Jeremiah 29:11 printed on them caught my eye when I was browsing Amazon recently. This would be a keepsake for your child as well as a very practical gift. Such a great idea for rewarding positive behavior; these each have a scripture printed on them and include rewards like going to the park or a special date with Mom or Dad. Teach the Bible to your preschooler the fun way with this Beginner’s Bible Sticker and Activity Book. Reusable stickers are SO much better than the alternative! We have several reusable sticker books and they’re also a great item to include in busy bags to take to church. This is a really fun way to tell the Easter story. We did our own version of Resurrection eggs one year but having this set with the items already included in the eggs would have been much easier! Kids 6 and under will enjoy the colorful illustrations in this very popular Children’s Bible. 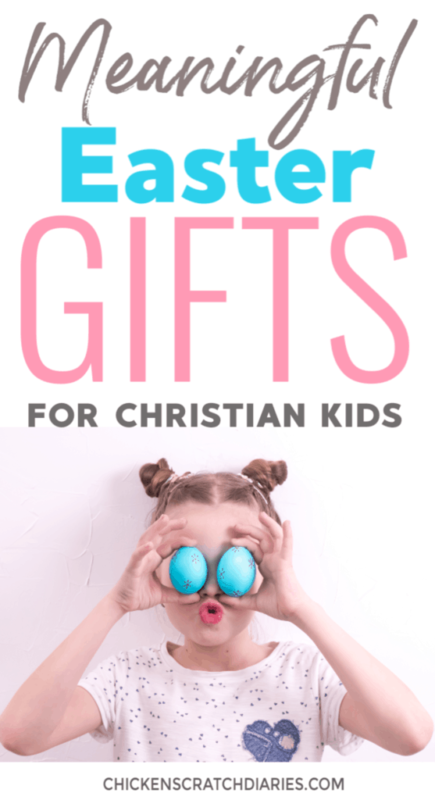 • Related content: 30 (Budget-Friendly) Gifts Christian Kids Will Love! The “God Gave Us..” books are some of our family’s favorites. They tell Bible truths in a beautiful way that kids can grasp. Conveying the power of prayer to young kids – it’s never too early to start! A colorful Bible that will appeal to younger girls through tweens, with wide margins to encourage note-taking and journaling. A combination of journal + crafting medium, this cute book can also be used for recording prayers and scripture. If your kids love bullet journals and the “Wreck This Journal” they would probably like this too. My girls received this as a Christmas gift and we’ve really enjoyed going through it together. It tells pieces of Bethany’s story (as depicted in the movie Soul Surfer), and highlights her admirable faith and determination after losing her arm to a shark attack. We have the corresponding Girl After God’s Own Heart devotionals (for kids and tweens) so I know this one is a winner (at least we love them!). Magnetic verses – this is a fun concept for memorizing scripture. You can never have too many Bibles! This one is great for your creative teen girl – made with thicker paper and wide margins to help her discover the practice of Bible Journaling. A fun and necessary accessory for Bible journaling. I know that my preteen would LOVE this necklace. She’s been begging for some new jewelry to wear to church and this would suit her style for any occasion. I would consider this room decor + useful Bible study tool. Also from the Sadie Robertson line, the set includes 52 scripture cards which attach with a magnet to the front of the box. Cute idea! And one more from Sadie Robertson 🙂 This devotional has received great reviews and it’s on our list next! This scripture plaque made of wood planks would be cute on a nightstand or a shelf. An easy-to-carry compact Bible for carrying at school or anywhere. This book tells it like it is, which most boys can appreciate. It encourages them to take Jesus seriously by addressing challenges that teens face and how to address them through prayer. We just finished the video Bible study based on this book in our Youth class at church and LOVED it. I would highly recommend this book. A practical, faith-based guide to everything a young man needs to survive in life. A useful gift for your (older) teen sportsman. For the coffee fans. Fill it with his favorite k-cups! If you choose to give gifts at Easter, I hope this list makes your shopping a little easier. Many of these ideas would be great for birthdays, Christmas, graduations and Sunday School promotions as well. No matter what, I pray that we can all take time to reflect on the true meaning of Easter and find joy in a living, loving God. • 30 (Budget-Friendly) Gifts Christian Kids Will Love! Brandi is a writer, parent educator, wife and mother of four. She has a love/hate relationship with coffee and technology and owns more cardigans than she'll ever admit. Above all, she strives to encourage weary moms to lean on Jesus. Tons of resources! Wow! We love the Resurrection Eggs! Chicken Scratch Diaries is a participant in the Amazon Services LLC Associates Program, an affiliate advertising program designed to provide a means for sites to earn advertising fees by advertising and linking to Amazon.com. Copyright Chicken Scratch Diaries 2019. Theme by Bluchic.